Das Apartment zur Selbstverpflegung befindet sich im umgebauten Erdgeschoss unserer 400 Jahre alten Olivenfarm. Die Gelegenheit, einen schönen ländlichen Rückzugsort mit Aspekten von Wald, Olivenhain oder für den Künstler in Ihnen (Staffelei verfügbar) Aussicht auf andere Dörfer in den Bergen zu genießen. Ein sehr beliebtes Gebiet für Radfahrer, aber innerhalb von 15 bis 25 Minuten zu Fuß zum lokalen Bergdorf und auch 3 wunderbare lokale Restaurants / Bars. Die Farm ist durch elektrische Tore (ein Schlüsselanhänger nach dem Check-in) zugänglich, um ein sichereres Parken zu bieten. Da wir in den Hügeln gelegen sind, haben wir Stufen vom Parkplatz und hinunter zur Wohnung, so dass wir wissen, dass dies nicht für jeden geeignet ist. Gerne helfen wir Ihnen mit Gepäck oder Shopping, wenn wir vor Ort sind. Tour durch Italien? Wir sind etwa 40 Minuten mit dem Auto von Lucca entfernt, eine Stunde von Pisa, Florenz, der Küste von Viareggio und etwa 80 Minuten von Abetone entfernt. Die Stadt Pescia ist in etwa 20 Minuten mit dem Auto erreichbar, eine begrenzte Anzahl von Bussen ist ebenfalls verfügbar und bietet Zugang zum Zug für Verbindungen in ganz Italien. Pescia hat zwei Wochenmärkte und eine große Auswahl an Bars, Cafés, Restaurants und Gelaterias. Unsere Gäste genießen die Nutzung ihrer eigenen privaten Sonnenterrasse mit Liegestühlen. Sie sind auch mehr als willkommen, in den Olivenhainen zu Fuß zu gehen und in der Saison alle verfügbaren frischen Früchte und Kräuter in den Gärten zu nutzen. Eine kleine, kuschelige und liebevoll eingerichtete Unterkunft, die von einem jederzeit herzlichen Paar vermietet wird. Ein Highlight ist ohne Frage die Terrasse mit tollem Ausblick und Privatsphäre. Ich würde mich jederzeit wieder dort einmieten, wenn ich noch einmal in die Toskana fahre. Danke für die wundervolle Zeit. We had a wonderful time in Castelvecchio. Kathy and Paul are heartwarming, interesting and very nice persons. They make a fantastic olive oil!! The apartment is beautiful, tasteful and everything you need is there. The sunny terrace is perfect for eating, relaxing, reading and looking to the green hills with the typical tuscan villages on top. Round Castelvecchio is a lot to visit and very good restaurants. Dear Kathy and Paul, thank you for that week! 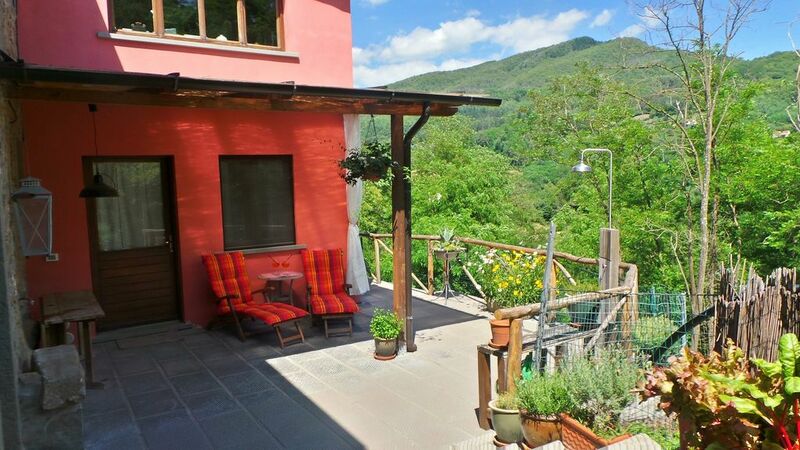 The apartment is cosy and comfortable for two people, located on an olive farm, just 15 minutes out of Pescia. It offers you everything you need for a relaxing holiday. Paul and Kathy are the best hosts one can have, willing to go the extra mile for their guests. We will definitely come back! Fabulous apartment, perfect location, fantastic hosts. You’ll want to return next year! We spent the last four days of our holiday here and were delighted to discover a real gem. Kathy and Paul made us so welcome and supplied a really generous hamper which meant we could have a long lazy breakfast on our first morning, sitting on the wonderful private terrace looking at the mountains and listening to birdsong. Heaven. The apartment is beautifully finished with quality furnishings (the most comfortable bed we had in Italy! ), excellent kitchen equipment and a really good shower in the stylish bathroom. Outside were two very comfortable loungers, table and chairs, bbq, and herbs and salad to pick. They’ve really thought of everything here! The olive trees were fantastic and the woodland with its stream was a good place to explore (listen out for the wild boar snuffling around at night on the other side of the fence!). Everything is so well kept. Kathy and Paul were really friendly and on hand should we have needed anything but they took great care to ensure we had our own space and privacy. Having moved here a few years ago they were very knowledgable about attractions, locally and further afield, and kindly made a reservation for us at an excellent local restaurant. The local town has two very good supermarkets and all the necessary shops that you’d need. We enjoyed Lucca, about 40 mins drive away, with its many traffic free squares and side streets and interesting shops and restaurants. A walk or cycle round the amazing ramparts is a must. A great base to explore this part of Tuscany, and equally easy to just stop, unwind and read whilst stretched out in the sunshine. Thank you Kathy and Paul - we’ll definitely see you again next year. Bedlinen and towels are supplied to cover a full one week period. We will be happy to provide a linen change and/or towel change mid-stay at the rate of €5.00 for 2 towels, €10.00 for extra linen. Should you require heating in the colder months, this would be charged at the rate of €10.00 per day. Please let us know if you need this included within your quote.